Given the success of Amazon's Echo, Apple's bet on the smartwatch, in retrospect, may well have been a serious financial and strategic miscalculation. Venture Beat: While Apple almost completely dominates the smartwatch market, it looks increasingly likely that the emerging electronics category of smart speakers — where the company already lags far behind — is on a far faster path toward mainstream acceptance. And that makes Apple’s failure to deliver its own HomePod smart speaker in time for the holidays, as promised, look like a huge missed opportunity. It’s hard to say that Apple bet on the wrong device category by deciding to focus on wearables. But it certainly seems the upside for smart speakers is far greater than for smartwatches at this point. It will take weeks before we know any actual numbers. Still, it seems smart speakers were one of the most popular holiday consumer electronics gifts. Indeed, just a week before Christmas, eMarketer projected that smart speakers were on track to outsell all wearables over the holiday season. In the three quarters ending in September, Apple sold 2.7 million Apple Watch units, according to IDC. Number two on the list was Samsung, with just 700,000 units. Apple is crushing all comers. And the Apple Watch LTE went on sale at the tail end of September, something the company hoped would give the product a boost heading into the holiday quarter. But eMarketer has soured considerably on wearables, of which smartwatches are a subset. It had lowered its forecast for 2017 early in the year based on soft sales. And for 2018, it’s only projecting 11.8 percent growth based on those lowered projections. The company projects that by 2019, 54.5 million adults in the U.S. will have some kind of wearable, including fitness bands. Contrast that to projections for smart speakers. Despite being younger products (the Amazon Echo arrived in 2015), eMarketer projects that by 2019 there will be 52.8 million smart speaker users in the U.S., thanks to far greater rates of growth over the next two years. Consumers are finding the devices far more useful as a gateway to the smart home and appreciate a generally lower price point, the firm concluded. 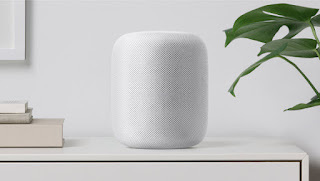 Apple was already coming late to the game, almost two years after Amazon launched the Echo in 2015 and the debut of Google Home in late 2016. Apple originally unveiled the HomePod at its Worldwide Developers’ Conference over the summer and said the device would go on sale sometime in December. But since then, the company hadn’t offered many updates — until confirming a few weeks ago that the HomePod was delayed. For the moment, it appears the absence of Apple in the market left the field wide open for Google and Amazon. As we noted yesterday, Amazon’s Alexa app jumped to the top spot of both the U.S. Google Play and iPhone App Stores’ free app charts on Christmas. And it ranked third on the iPad free app chart. In addition, Google Home app ranked second in the U.S. Google Play app store and sixth in the iPhone app store. On a more informal metric, VentureBeat’s own stories yesterday about the Google Home (I gave my parents a Google Home for Christmas and watched them lose their minds and 10 things to try with your new Google Home smart speaker) and Alexa devices (10 things your new Alexa-powered smart speaker can do) were among our most widely read stories of the year. It’s quite possible that the Echo on its own outsold the Apple Watch during the holiday season, although since neither Apple nor Amazon break out firm numbers on such devices we many never know for sure. Now, one can argue that the Apple Watch offers greater profit margins than smart speakers. Certainly Apple, Amazon, and Google operate under different business models. And Apple has made a career out of being late to a market but winning by being better. The question now is whether Apple can pull that trick off again when the HomePod finally makes its debut in 2018. Right now, it looks like the world’s most valuable company missed the boat on consumer electronics’ hottest new category.